The essential question of education has given rise to a report “For a national compact on education in Haiti”. The findings are unfortunate, let us quote the foreword: “The country has therefore chosen not to invest in education even while the demographic pressure (3.5% in 2010, among the highest in the region) only further increases the demand for resources for the educational sector. There were 2,793,829 Haitian women and men (38.8% of the total population) who never attended a classroom? That the state owns only 8% of the basic schools and that 82% of the children enrolled in the Basic School are in a private school? That 56% of these schools operate in structures not meant for this purpose (houses, churches and arbours)? That 91% of these schools in rural areas operate without electricity? That 65% of them work without running water? That out of every 100 students who come into the first year, only 29 of them will go on to secondary school? That only 1.7% of school-age children with disabilities have the chance to attend school? Can this pattern change? Is it possible to break it? 50% of school-aged children were not attending school before the earthquake. Around 357,000 children between ages 6 and 11 (one portion of this age group) are not educated. The education system is marked by a large proportion of “over-aged” pupils, due to late entry into school for economic reasons or repetition caused by the low quality of teaching and the conditions of schooling. In the six years of primary school, French and Kreyol are taught equally in theory. The teaching of Kreyol in Haiti finds its legal basis in the law of September 18, 1979. This important law authorizes the use of Kreyol as a language written and spoken in education. In the capital, teaching is mainly in French; in the small towns and villages of the provinces, it is done in Kreyol; in the schools of the privileged classes of the capital, one teaches only in French. Textbooks are almost all written in French, with the exception of Kreyol grammars. During secondary school, French enjoys seven or eight hours of instruction, against only one for Kreyol. Since the earthquake, half of the schools (from 10,000 to 12,000) have been destroyed or condemned. It’s also important to highlight the situation of the teachers, that has long been in place. Before January 12, 2010, there were about 20,000 teachers in public schools in the country, including 7,000 in Port-au-Prince. We now know that 38,000 students and 1,300 teachers died in the earthquake. Certainly there will be a shortage of teachers in both public and private schools. Of the 60,000 teachers in primary school, nearly 80% have not received initial basic training. About 40% of these 80% do not have the Grade 9 level of education. Only 5% have a university education, 10% have a normal school degree and 6% hold a teaching aptitude certificate. Overall, those who teach in urban settings are better prepared than those who teach in rural schools. In general, teachers are not trained to teach children in Creole and can hardly write it; in rural areas, the majority of teachers have poor command of French. Many teachers work in both the public and private sectors, which leads to problems of non-availability, ie periodic absences of teachers in the schools. In 2003, the director of the school expressed the wish for the creation of a computer lab. 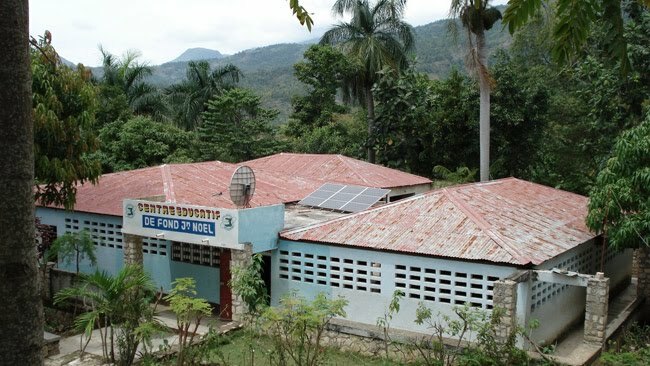 After analyzing the needs and available resources, two members of Haiti Futur went to Fond Jean-Noel to install a computer workshop with the necessary infrastructure for its operation (generator) and an internet connection thanks to a satellite dish. This facility is complemented by practical training with teachers (basic maintenance of equipment and office use). The two members of Haiti Futur have returned several times to Fond Jean Noël to complete the training of teachers. Because digital education can be an important tool in meeting the challenges of mass and quality education in Haiti as reflected in the “National Pact for Education in Haiti”, it was decided to replace PCs with a more modern, integrated digital classroom format with laptops, video projector and digital whiteboard. This operation was carried out with the help of Educatech, located in Port-au-Prince, which has been working for several years on the concept of digital class. A complete “pack” is delivered to the CEF accompanied by teaching material, some content (Encarta encyclopedia on cd-rom) and teacher training on the use of the digital whiteboard. A first assessment was made with the teachers during a stay in Haiti, during two working meetings organized with the teachers of the primary and secondary levels. The priority need is for pedagogical support and access to content mastered by the teaching staff. In this sense the encyclopedias provided with the material are misused or inadequate. There is a strong demand for pedagogical support which we have also echoed in the other schools we visited. 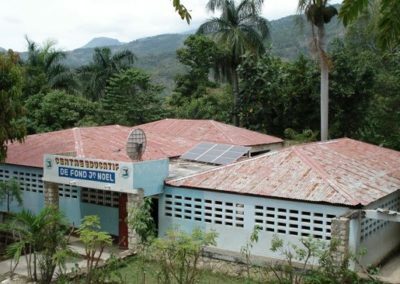 Internet connections in rural areas remain problematic in Haiti. The provision of computers – even in rooms designed for this purpose – can never fully meet the quantitative needs: students work at 3 or 4 per computer which significantly reduces the effectiveness of work sessions and the contribution of computer science. That’s why we have made teacher education the central focus of our support for the years to come. It seems to us that the digitization of classes, so promising, can not be envisaged without new pedagogical methods, based on experience and pragmatism. The importance of teaching content, in close collaboration with teachers. This analysis brought us closer to the DIENA (Interministerial Delegation to Digital Education in Africa) via its SANKORE program.